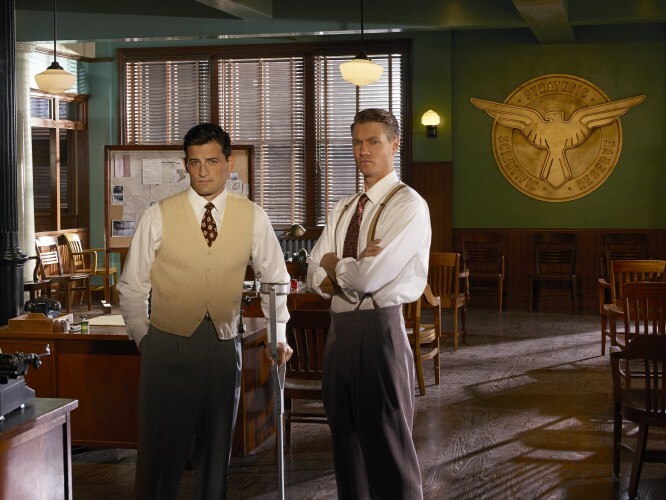 It may have escaped your attention recently, but Marvel has been consistently nailing good television on the head with the mini-series Agent Carter. It’s a show that hasn’t yet reached the UK shores, but I’m telling you now it’s a show that deserves far more than it’s limited 8 episode run. For starters it’s centred around Agent Peggy Carter, (who you may remember as Captain America’s almost sweetheart back in Captain America: The First Avenger), and her role for the Strategic Scientific Reserve in the wake of WW2. This is the first female centric superheroed outing we’ve had in a long time and as far as heroines go, Marvel really could not have done a better job in casting the lead Hayley Atwell. Managing to encapsulate both femininity and strength in her role, Atwell proves that Peggy isn’t a damsel in distress by any means, but rather a force to be reckoned with in her own right. Not only that, the show highlights the sexism of the era and one woman’s ability to fight against it. The story itself is well paced, with the main plot following Peggy’s journey to clear Howard Stark’s name after he is embroiled in a weapons scandal. Throw into the mix then, a Russian agent hailing from an early form of The Red Room, a charming butler, a plucky waitress, and half a dozen SSR agents and you’ve got the perfect mixture to set your story in motion and keep it fleshed out. In fact, I’d have to say the supporting cast really does breathe life into the story and give it a sense of tangible realism by being just as diverse as the world around us today. Take Enver Gjokaj for example in his role as Daniel Sousa, a man injured while fighting during WW2. Sousa walks with the aid of a crutch, but that crutch doesn’t define him. It’s a part of his day to day life, sure, but it isn’t all he is. Through every episode, it’s showcased his other skills as an agent from combat to reconnaissance to interrogation. He’s a positive role model to have and it’s still relevant to the story without him being thrown in to tick a few diversity boxes. Another bit of writing I have to commend is the clear signs of PTSD Agent Thompson (Chad Michael Murray) managed to bring to light. It’s easy to turn this kind of period piece into a testosterone overload, to let the men wade off to war and come back from it unchanged. The world doesn’t work that way and Marvel really helped to highlight that by showing a different aspect of being war wounded. The wound may not be physical, but the scars are still there – raw and healing and I think the fact that it was acknowledged is such a step in the right direction towards accurate portrayals of all walks of life. As if accurate representation and strong female role models weren’t enough to convince you that Agent Carter both needs and deserves a second season, then take a look at the stellar work performed by costume designer Giovanna Ottobre-Melton. A production isn’t quite itself without a good set of threads to help set the scene and tone and the costumes featured don’t disappoint. 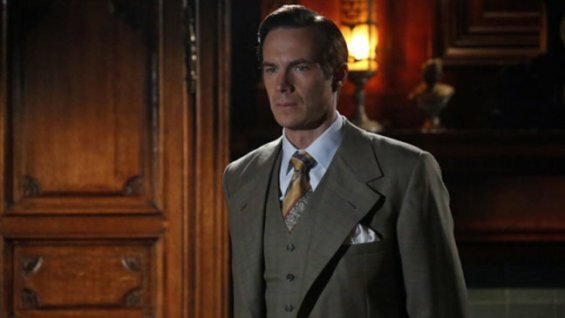 From the crisp clean cut of a waitress’ uniform right through to the prim and proper suits worn by Peggy’s proverbial partner in crime fighting, Edwin Jarvis, there’s such an attention to detail here. It’s stylish and period authentic, two things which again I find contribute unreservedly to the real-world feel of the entire show. The highlight for me so far, has definitely been Sousa’s sweater vest collection and even just for the knitwear alone, I’m proudly waving my flag to show support for a second season. There are so many directions the show could go on, with so much scope and possibility for adding colour and texture to an ever growing universe. The MCU movies thus far have laid the ground work, but it’s series’ like Agents of SHIELD and now Agent Carter that are helping to fill in some of the blanks and give the universe the depth it deserves. 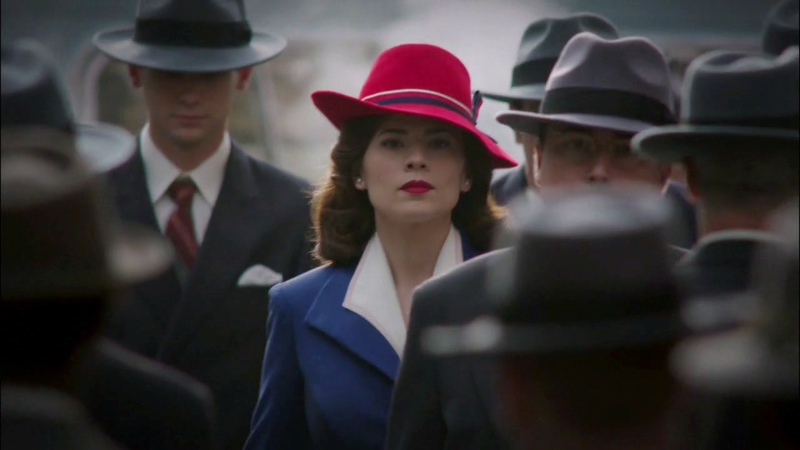 The cast has a chemistry that can’t be manufactured, the setting and design is undeniably magnificent and I think by all rights Agent Carter deserves the chance to shine for a little longer. So please studio executives, renew Agent Carter for a second season, or at the very least find a way to make it across the pond for UK syndication!